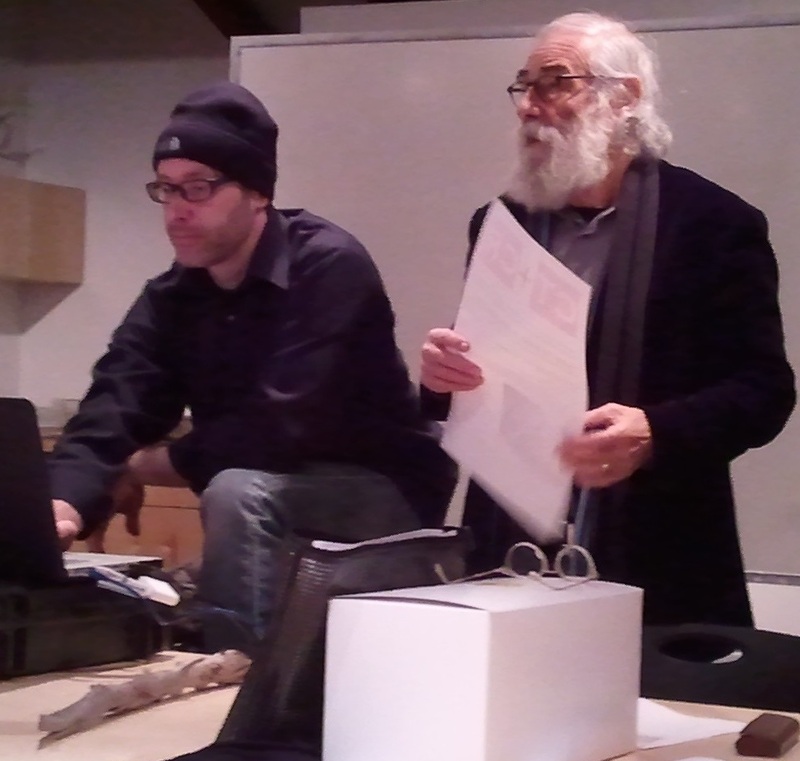 A couple of weeks ago I gave a lecture at the Research Design and Methods Seminar at Pacific Northwest College of Art. The class is part of the new MA Critical Theory and Creative Research program. It was a real pleasure to discuss documentary filmmaking with the students—who each had their own unique perspective on film and the role of documentaries. They brought up a myriad of excellent points concerning the difficulties in representing someone else’s story, especially through such a pervasive medium. I titled my lecture “How To Make A Documentary,” but it was less of a discussion on the method of making documentaries than it was a zoomed-out analysis of how documentaries effect the way we perceive other cultures, which is great—I feel we really got to the crux of many of the issues and perplexities that surround documentaries. Some of the topics that came up in the conversation included the unavoidable obstacles encountered in documentary filmmaking (especially in the case of filming in non-first world countries), what should and should not be represented in a film (traumatic events, personal stories), how films can misinform our impression of another culture (creation of stereotypes), and the overall importance of traveling (I was really surprised to hear how well traveled many of the students were!). The students were really engaged in the conversation. When the class ended, and even a bit during the lunch break, I was able to speak to some of the students individually and hear about their research projects. It was interesting to learn how many of them were integrating photography or film into their projects. It was a great experience to partake in such an observant class. Many thanks to the PNCA MA Critical Theory and Creative Research program for having me! Also, here’s a link to the poster for the event! Thank you so much to everyone who was able to come out and attend the rough cut screening of ‘Journey to Kathmandu’ back in August. Based on the feedback, the screening went really well. I received some great suggestions concerning pacing and narrative structure. Finishing this project has certainly been a challenge, but I feel as though it is really coming together—especially after the screening. With all of the feedback in mind, I was able to advance through another huge stage of the editing process and polish a considerable amount of material. I actually worked on a final cut of the film through most of October. Right now, I am currently looking for a score that will tie in nicely with the footage. I cannot wait to show everyone the story of this remarkable festive tradition. That being said, everyone can anticipate a final cut in spring 2013! On Thursday, August 29, 2012, I will be unveiling the rough cut of ‘Journey to Kathmandu‘. A small select group of people will be gathering to be the first eyes to see the film that I’ve been editing since January, 2010. To say that this has been a long time coming would be a vast understatement. And while I have the usual butterflies and anxiety that comes with showing your baby to the world for the first time, I’m also quite eager to see what people’s reactions will be to it. But more than that, I’m eager to see how this group of colleagues, professionals, friends, can help me make a film out of this beast! It’s been a while since I’ve hosted a rough cut viewing – though I’ve attended a couple fairly recently – and I kind of needed a little refresher on how these things best function. I did a little research online in hopes of better understanding how I might maximize the evening in order to get the best possible feedback from my group. One particularly helpful resource was an article from the NewDocEditing website. It lays out some great ground rules for hosting your documentary rough cut screening. Look for a follow-up to this posting after tomorrow night’s screening, detailing some of the interesting things that I will have learned from people’s feedback! What’s this thing about anyway? Is it about goats in Nepal? Is it about the people and culture of Nepal? Is it about Dashain Festival? Is it about a chai walla and his family? 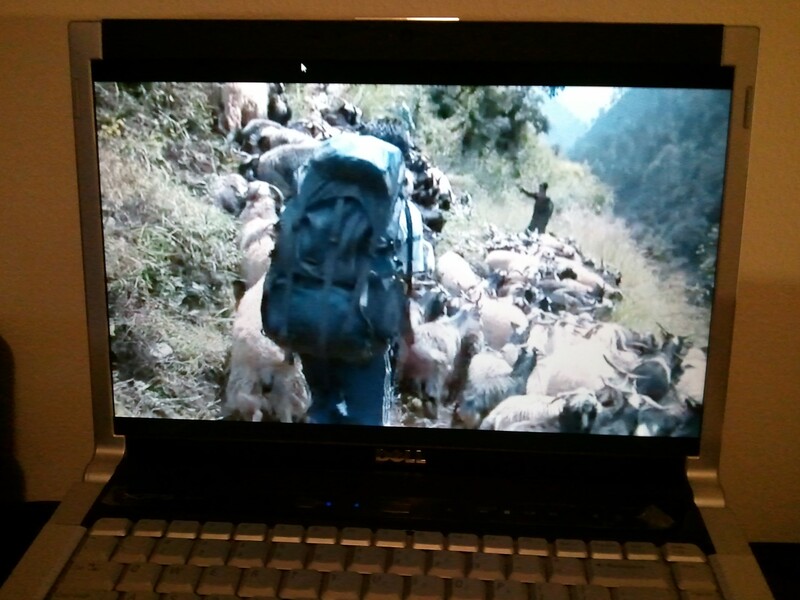 Is it about goat herders and their goats and the annual trek they make once a year? Should the section in the mountains stay or go? Is there enough of Prem-ji and his family? Am I correctly representing the people, their religion, and their sacrificial practice? What about the goats… are they gonna have any say in this?? The video – still painful for me to watch even now, two years later – gives a glimpse into the perils of the independent documentary filmmaker. It’s a glimpse that many an independent filmmaker can surely appreciate! Came across this little gem today when I was cutting one of the scenes from Prem-Ji’s hometown of Gorkha. This had been taken right after a 5 hour bus ride up the last mountain to his village. I use the phrase “bus ride” quite loosely, mind you. My translator, Raj Kumar and I, were sandwiched in between about 40 other Nepalese festivalers who rode with us on top of the bus. We pretty much careened back and forth along this mountain as we slowly (ever so slooowly) worked our way up to the village. Truly one of the more treacherous rides I’ve taken. A side note: The Buffalo Sabres hat that I’m wearing in this clip was lost for about 60 secs and there was no way I could or would get off of the bus to gather it up. So one rather fine young gentleman lept off the top of the bus, ran down the road, gathered up the hat and climbed back on top of the bus, smiled, and handed it back to me… all the while, said bus never stopped moving. Yep. One more thing. Do not let this clip fool you. And there is no need to worry: I am NOT in this film. This is strictly behind-the-scenes. And this film will NOT be in black and white. Oh no. Nepal shall be seen in all of its colourful glory. 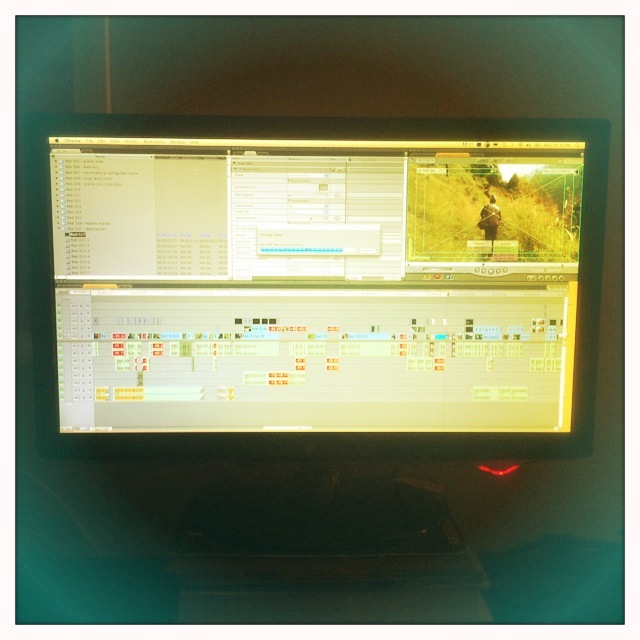 Just a quick note to let you know that I’m continuing to “edit like the wind” on this film. A rough cut is truly shaping up and I’m anticipating gathering a select group of people to view the film and give feedback in a month’s time. Rough cut. Perhaps you’re familiar with this term. Certainly my industry colleagues are. They probably use the term about as freely as a writer would use the term rough draft. Rough Cut is also the name of a Don Siegel film from 1980. South Korea released a film under this title in 2008. There was a Canadian television series about documentaries using the moniker, Rough Cuts. And there is also a not very highly acclaimed American heavy metal band named Rough Cutt. ‘Journey to Kathmandu‘ is inching ever closer to officially being called a rough cut. 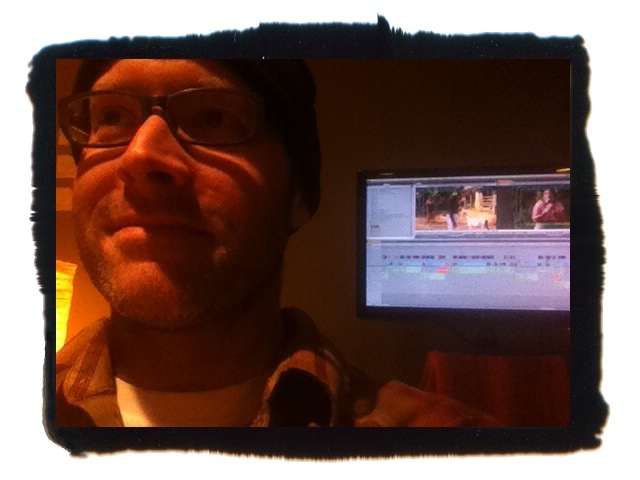 Or better put, I am closer to having a rough cut of ‘Journey to Kathmandu’. And I’ve decided to do something that is quite often a big no-no, if not an all-out blasphemous thing for a filmmaker to do. I’d like to let you in on the process a little bit. A sneak preview of the rough cut, if you will. You see, usually, the rough cut is announced when the filmmaker is ready to have their project be seen by a select group of people so as to gather all feedback before moving on to a re-cut of the film. During the course of the rough cut edit, rarely does the filmmaker show clips or scenes of any kind for fear of his prospective audience not having any context with which to view the scene. It makes better sense for the filmmaker to wait until he/she is ready for people to provide significant feedback in the context of the film as a whole. I am doing no such thing. I am showing a rough cut of a scene. I have my reasons. Which I, as the ever self-aware (obnoxious?) filmmaker, will even share with you. (1) It’s been two years since ‘Journey’ was shot and people need to know that the damn thing still exists. It exists people. This is proof! (2) I need to know, for myself, that this film still exists. It does. 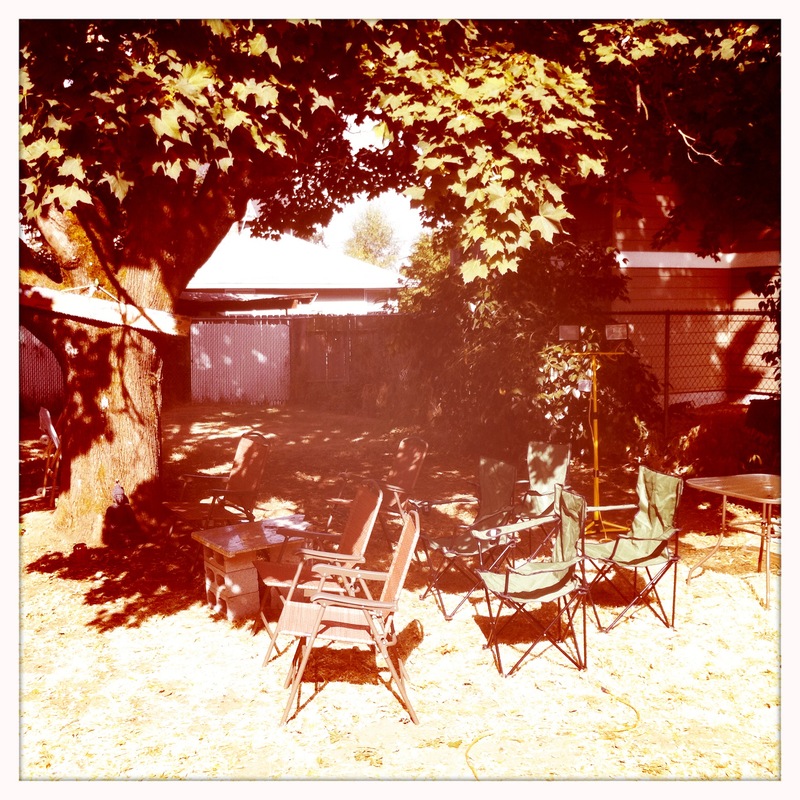 (3) I needed a reason to write a blog entry. This is that reason. Check out the proof. A scene from the film. From the rough cut of the film. Keep in mind, it’s, um… rough. This means that it’s raw editing. Absolutely no color correction, sound sweetening or even all-together proper usage of Broll has happened. So please don’t give me your feedback. (You really don’t have any context from which to give a feedback. Remember: this is a rough cut of a scene and not the rough cut of the film!) Just your gentle encouragement. Your unflinching support, if you will. One more thing: it should be noted that a rough cut viewing of any kind whatsoever can be a highly nerve-rackingly anxiously exposing process to the artist (which I do not, by the way, claim to be). So, well, like I said… unflinching support. Okay, more specifically, an opening has now been cut. Actually, it’s been re-cut. Was headed in multiple story and format directions over the past few months, but thanks to the kind feedback and direction of fellow doc makers, Byrd McDonald and Heather Harlow, I am quite back on track. Well, a single story/format track. Thankfully. I am so very tempted to upload and share with everyone… believe me, I am… and I may still do so… but not quite yet. Need to really think about! I mean, I wouldn’t want to spoil anything, right? However, I also want to re-spark everyone’s interest in the project. Hmm, let me think on this. That’s an update. More later. Really. But for now, I am headed to Cambodia for the next three weeks to work on a couple of commercial gigs through Barang Films. Cheers. Soksabai. Namaste. You catch my drift. We hope that you enjoyed the first Relief International video (that we posted last week). This is the third and final (and dare we say ‘favorite’?) of the RI videos that Barang Films produced. I think it not only captures the brilliant work and building of sustainable lives that RI is helping to foster in Haiti, but it also captures the undying spirit and positivity of the Haitian people. Again, Barang Films would like to thank the many good souls of Relief International (Emily, Farshad, Joseph, Richard, Sony, Seth, Nikki, Emily, Daniel, Jace, etc) for the wonderful opportunity that was this project in Haiti. And we would also like to express gratitude for the generosity of the citizens of Haiti… the perspective that you have given us shall be felt deeply for a long time. And lessons that you have taught us… hopefully for a lifetime.